The qualification tournament for Asian teams also doubled as a World Olympic Qualification Tournament and took place in Japan from May 28-June 5, 2016. The hosts were joined by the top three ranked teams from Asia according to the FIVB Men’s World Ranking (Australia, China and Iran) as well as the second and third placed teams from the European Olympic Qualification Tournament (France and Poland), the second placed team from the South American Olympic Qualification Tournament (Venezuela) and the second placed team from the NORCECA Olympic Qualification Tournament (Canada). The the top three ranked teams (Poland, France and Canada) joined Iran as the best ranked Asian team in qualifying for the Olympics. 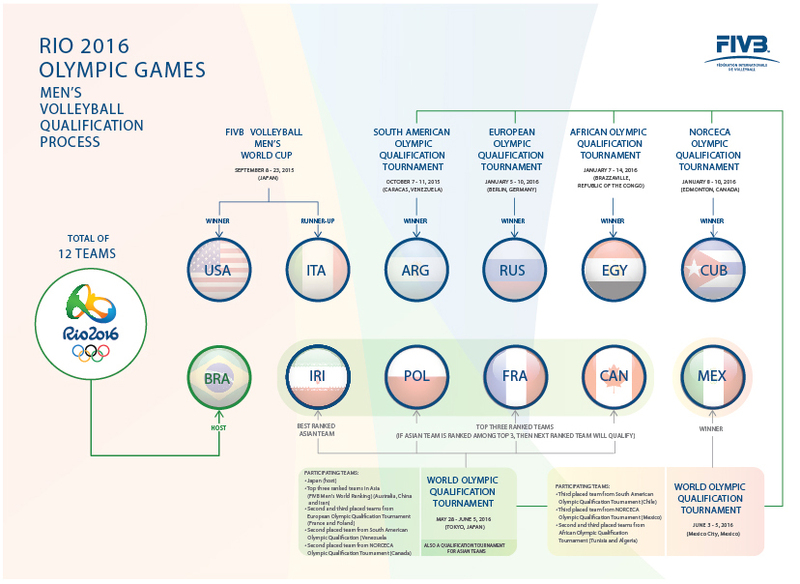 The final vacancy was decided at a second Men’s World Olympic Qualification Tournament in Mexico from June 4-6. The third placed team from the South American Olympic Qualification Tournament (Chile), the third placed team from the NORCECA Olympic Qualification Tournament (Mexico) and the second and third placed teams from the African Olympic Qualification Tournament (Algeria and Tunisia) competed for the berth, with the hosts earning to right to go to Rio 2016. Once all qualified teams have been confirmed - following the last World Olympic Qualification Tournament in June - the twelve teams will be split into two pools using the serpentine method. 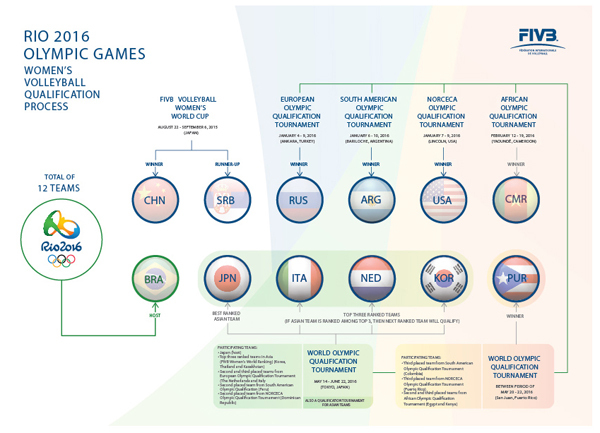 FIVB Volleyball Women’s World Cup Japan 2015 winners China and runners-up Serbia were joined by the five winners of each Continental Olympic Qualification Tournament (Africa: Cameroon, Asia: Japan, Europe: Russia, NORCECA: USA and South America: Argentina). The qualification tournament for Asian teams also doubled as a World Olympic Qualification Tournament and took place in Japan from May 14-22. The hosts were joined by the top three ranked teams from Asia according to the FIVB Women’s world ranking (Korea, Thailand and Kazakhstan) as well as the second and third placed teams from the European Olympic Qualification Tournament (the Netherlands and Italy), the second placed team from the South American Olympic Qualification Tournament (Peru) and the second placed team from the NORCECA Olympic Qualification Tournament (Dominican Republic). The top three ranked teams (Italy, the Netherlands and Korea joined Japan as the best ranked Asian team in qualifying for the Olympics. As Japan was ranked among the top three and the best ranked Asian team, the next ranked team qualified, on this occasion Korea. The final vacancy was decided at a second World Qualification Tournament held in Puerto Rico from May 20-23. 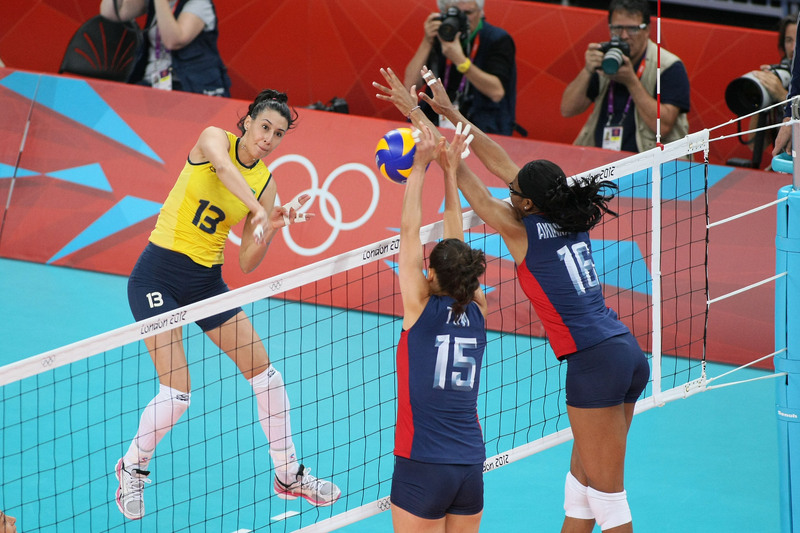 The third placed team from the South American Olympic Qualification Tournament (Colombia), the third placed team from the NORCECA Olympic Qualification Tournament (Puerto Rico) and the second and third placed teams from the African Olympic Qualification Tournament (Algeria and Kenya) competed for the final berth, with the hosts earning the right to go to Rio 2016. Once all qualified teams have been confirmed - following the last World Olympic Qualification Tournament in May - the twelve teams will be split into two pools using the serpentine method.